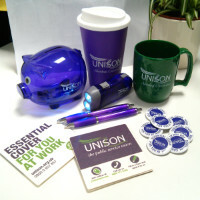 As you may know, the branch was recently awarded a £1,500 grant to buy new UNISON goodies for new members and curre. Well a lot of the new things have now started to arrive, so come along to one of our recruitment stalls. Ask your local steward where the next one is, or contact us online to find out. Recycled Kafo Mugs - with added sparkle! Make sure you like us on Facebook and Twitter to keep up-to-date on when we're having our stalls.